Steve Wozniak, Apple (s aapl) co-founder and worldwide technology celebrity, predicts that Android (s goog) will dominate iOS before long. Wozniak, speaking to the Dutch newspaper De Telegraaf, shared his thoughts on various topics in his usual candid manner, but the Android/iOS war was front and center throughout. Apple was satisfied with the quality of the smartphone but wanted something it could amaze the world with. When Apple releases products, they need to be groundbreaking. Companies should hold off on entering markets until they have a seriously compelling product to offer. Products like that need to be be [sic] developed in isolation from the rest of the company, and it requires developers to steer clear from paths already traveled. While Wozniak still feels the iPhone is the superior product on the market, he also acknowledges it’s not for everyone, due to the closed nature of the operating system and iTunes dependency. He appreciates the broader range of options that Android affords users. 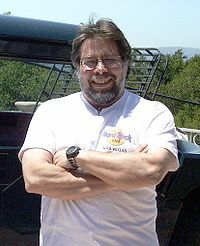 Wozniak sees the relationship between iOS and Android as similar to that between Mac and Windows, respectively. In light of that comparison, Wozniak acknowledges the problems in consistency, quality, and user satisfaction that Android faces, but thinks they’ll be overcome to match and eventually dominate iOS as Windows did the computer market. The faith Wozniak seems to have in Google being able remedy its shortcomings (and the inferred lack of faith in Apple to do the same) probably won’t be too well-received by Steve Jobs as the Google/Apple battle continues to heat up. But at least when the “wonderful wizard of Woz” speaks, he never disappoints. Woz has always called them as he sees them. What he is saying now is what he and a LOT of others think. The fan-bois wont like it, but that’s the way it is. 1. OSX – Chrome OS will never touch this. 3. Continuous innovation (iPod, iPhone, iPad, Apple TV, MacBook Air) all way ahead of competition and while Google may copy better and faster than Microsoft, there’s no sign of Apple slowing down. 4. Now that they are the 2nd largest company in the world and have a cool $50 billion ready for a rainy day its a very different time when Microsoft ran away with the desktop market. Also, with apps and content there’s no reason that Apple will lose out (that was what was missing against Microsoft – software content). Probably the the most poorly written headline this week. I suppose replacing “market” with “iOS” will garner more hits.